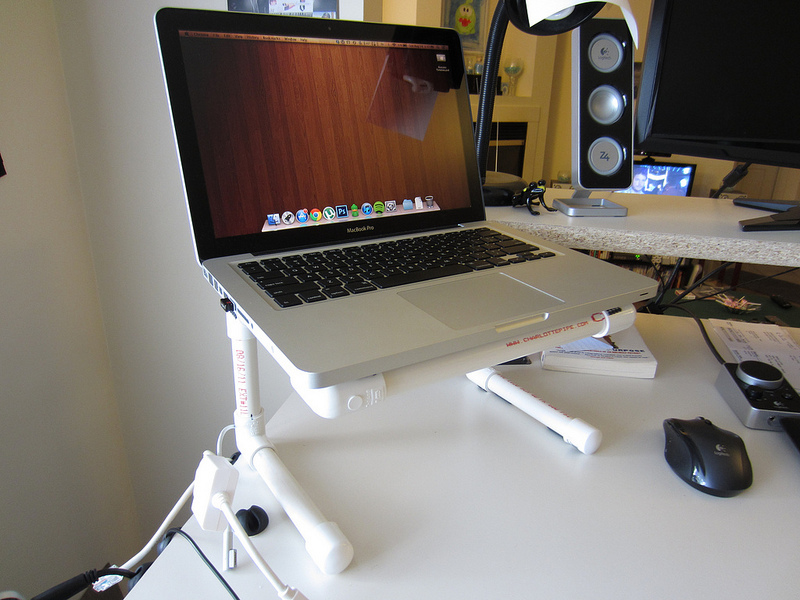 A laptop stand is a great thing to have if you’re working at a desk. It not only allows your laptop to breath more easily and run cooler (since it’s propped up), but it also makes your setup more ergonomic by having your laptop’s display at eye level. You can buy laptop stands pretty much anywhere, and they come in all different shapes and sizes. However, they’re pretty expensive — one of my favorite laptop stands is the Griffin Elevator, which rings in at a cost of almost $35 on Amazon. I wanted to see if I could make my own laptop stand that closely models the Griffin Elevator, but build it for the fraction of the cost, and I believe I have succeeded greatly. Here’s how to do it. Putting this PVC laptop stand together is straightforward and easy, and there’s no pre-determined measurements that you need to follow, since all laptops are sized differently. All you need to do is cut your PVC pipe into seven different lengths. One of the pipes should be roughly the length of your laptop, four of them should be roughly the width of your laptop, and the other two determine the height of your stand, which is completely up to you. After you have your seven lengths of PVC pipe, it’s time to start assembly. Simply just attach the pipes to the joints. Refer to the photo above as a guide. 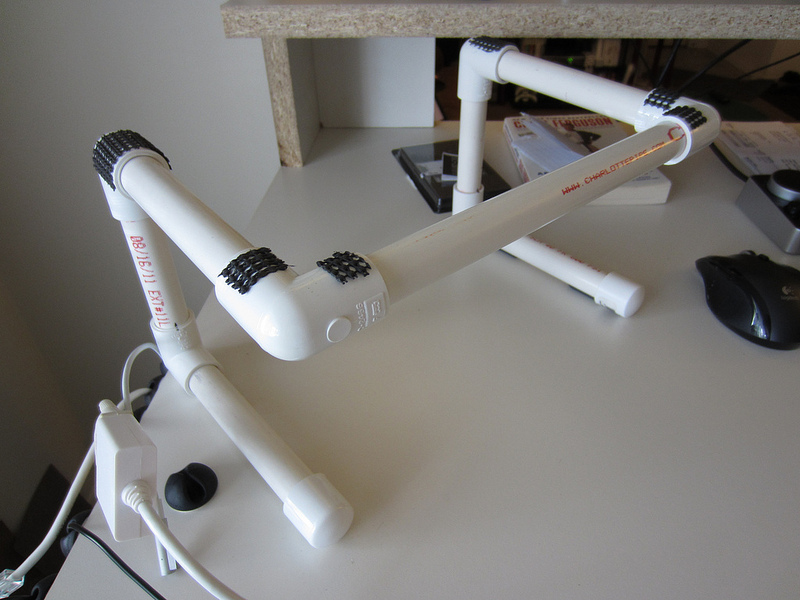 If you want to make the stand really sturdy, you can glue the pipes and joints together with some PVC cement. After you’ve assembled the stand, ideally you want to add some kitchen drawer grip liner to the base and at the top. This stabilizes the stand and keeps it from sliding around. It also prevents the laptop from accidentally sliding off the stand easily. Cut out small squares of grip liner and glue them on (pictured above) using some super glue or any other glue you have lying around. You’re done! That was all there was to it. It’s arguably the best DIY project that I’ve ever done because it’s quick, simple, useful, and it hardly cost anything.